The QCBOX Model 5 is a non-conventional unit designed to fulfil actual and future needs of an electro-acoustical analyzer like the CLIO system. It is USB linked to a PC and can be configured, with dedicated software controls, to assist frequency response and impedance measurements or to perform DC measurements. Using it for frequency response measurements acts as 50W power amplifier to drive the speaker or network under test while routing one-of-four inputs to the analyzer as well the current sensing output. The four inputs are able to provide a phantom power supply both for Audiomatica or general purpose microphones (0-24 V range, software controlled). Impedance measurements can be done either switching the D.U.T. ?s load across the analyzer?s input or using a dedicated output, ISENSE, thus allowing impedance measurements in constant voltage mode as well voice coil current distortion analysis. An internal ADC measures the DC current into the voice coil. Thanks to an internal software controlled voltage generator the speaker can be driven with a superimposed DC voltage (±20V), allowing for measurements of large signal parameters. Two ADC converters with a ±2.5 V and ±5 V are available at inputs 3 and 4 to measure the displacement with a laser sensor or any other DC signal. A dedicated digital input handles an external foot pedal switch (or TTL signal) to be connected and triggers QC operations. 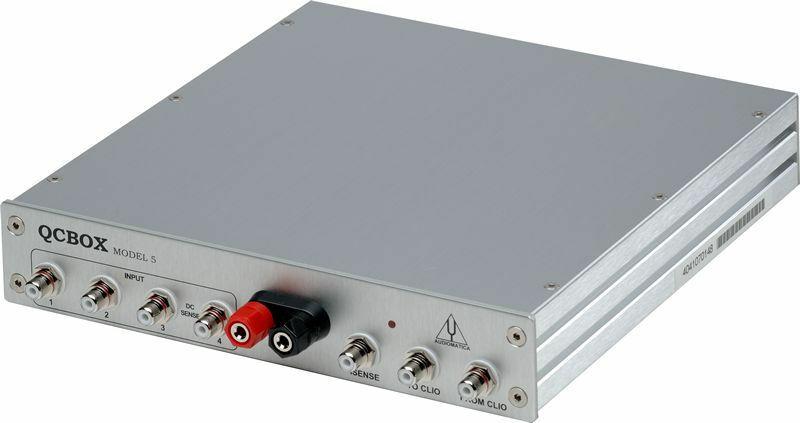 A 6 bit output - 5 bit input TTL digital port is available to interface the QCBOX and driving software with external hardware (like turntables for example). More than one unit can be stacked to route more than four channels. The QCBOX Model 5 finds use both in laboratory for R&D applications and in production lines setups.